The month of March is devoted to The Second Step: Look at Your Own World. If you’d like to share a post about what you learned about compassion (The First Step) or what you’re seeing in your world, use the link list below or join the discussion in the comments or on Facebook. First, I want to give an update on the MOOC, massive online open course, that I started last week. Religious Literacy: Traditions and Scriptures relates to many of the same issues as Twelve Steps to a Compassionate Life. In the first week, we learned about the difference between studying religions and practicing a religion and what the benefits to study are (although that’s not at all saying it’s a superior approach, just a helpful one). The class material, so far, is superb — definitely worth the price of entry (it’s free) and the time to read and watch. I’m disappointed that the discussion forum software isn’t adequate for the task at hand. One of the draws for this course was the opportunity to interact with people living around the world who have vastly different religious experiences. I’ve seen the diversity and appreciate it. The interactions, though, are impeded by the software. This is doubly disappointing since I use forum software every day at 3 Fat Chicks that handles even more people than are registered for this course. The course advertised that it would take three hours of effort each week. I spent more than that on the first day! So, that’s the plus side of the discussion being less than I hoped for. I can curtail that aspect and get much closer to the three hours a week that I allotted. There’s still plenty of time to join us! If you live in St. Louis, a friend has started a real-life study group for both this class and Twelve Steps to a Compassionate Life. Let me know and I’ll see if I can hook you up. I’m very much looking forward to meeting these people this weekend! I’m going to focus on two problems that keep cropping up when I work with this chapter. I hope by making them very clear in my mind (and yours, so you can keep me accountable), that I’ll be able to approach this step in a more appropriate way than my initial effort. Second, I keep wanting to jump to action items as I look at the world. But, this chapter is about looking and assessing. We can identify some possibilities for later action, but now is not the time to settle on anything. Now that I’ve looked at these two together, I see a trap that I’ve been falling into. It’s easy to be contemptuous of, say, Trump supporters. But, it’s also clear that I have no ability to create change in that arena. When I approach a situation with both contempt and a too-quick search for solutions, what I get is permission to do nothing. If I take the time to look at my world with a less judgmental view and one that is about assessment rather than action, I stand a much better chance of identifying what works and what doesn’t so that I can align myself with the successes. So, that’s what I’ll work on for next week’s post. What are the opportunities and possibilities for compassion in my communities? What are you doing to learn about compassion in general or in the specific arenas in your sphere? I love how you take this slowly. I tend to rush through things, checking them off quickly…Done! Compassion should be something that takes time. Thanks for the reminder about, say :), contemptuous thoughts about Trump supporters. It definitely is difficult to have compassion in that area for me too. Looking and assessing can be very challenging steps. Good luck with it all. I’m really enjoying your Compassionate Sundays. Observing without being judgmental can be challenging. In studying mindfulness, not being judgmental about ourselves is even harder. But if we can remind ourselves to be compassionate to ourselves and others, I imagine that’s a start. Good post! Thanks for sharing! Too bad about the discussion forum on MOOC. Funny that you mention Trump supporters, because that’s exactly what I thought of before you mentioned him. That’s probably because I’m currently having a Facebook discussion/argument with my cousin about Trump and his supporters, I suppose. As for learning about compassion in my own sphere – while I was on my ambulance ride-along last week, I got an interesting look at the difference between compassion of police vs. social worker vs. paramedics with a mentally ill man. I thought they all handled the situation as they must, but the compassion was from very different perspectives. Thanks for that example, Rachel! I can definitely see that people might take on each of those professions with a motivation of compassion and that they would all play out differently. I am going to work on the theme of thriving not just surviving in my faith. Building in a true love of my life and asking the holy spirit to truly guide me every day this week. Looks like a book I’d like to read and give to others I know too! I found the Religious Literacy class very time consuming too, but I am thoroughly enjoying it. It’s hard to pick a favorite, but I found the TED talk of Chimamanda Adichie brilliant. Her “The Danger of One Story” is eye-opening. It’s one I look at often. 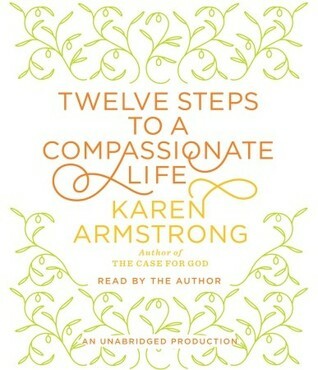 The class is a very good companion to the 12 Steps To a Compassionate Life. I have also struggled against personal judgemental-ism. You can tell how long it’s bothered me by the age and translation of a Biblical quote I memorized at an early age: “Judge not lest ye be judged.” It’s why I want to embrace a compassionate life. Great post Joy. Have a great week ahead.